By Xah Lee. Date: 2016-10-30 . Last updated: 2016-11-08 . Microsoft Reclusa Gaming Keyboard came out in 2007. 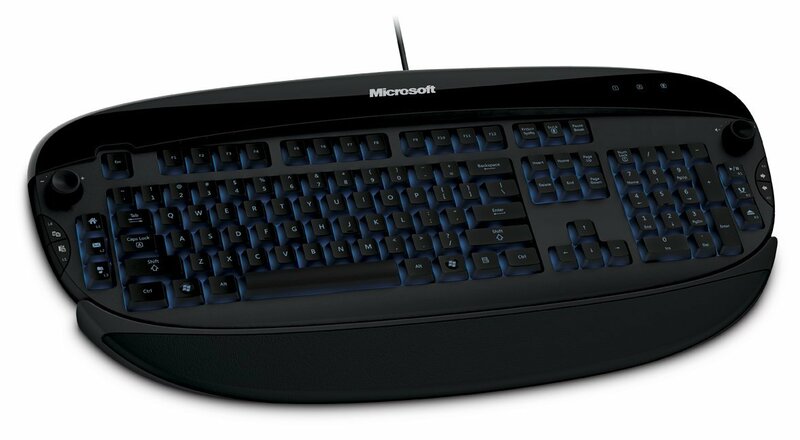 The Microsoft Reclusa gaming keyboard sets a new standard in gaming innovation. Reclusa will help set gamers apart from their competitors with advanced features and best-in-class design elements such as ambient backlighting, Hyperesponse gaming key action for maximum response with minimal latency, and two built-in gold-plated USB ports. With Backlighting keeps you in control in any lighting situation. See more features. A smart cabling system allows you to stow away the USB cable. this keyboard, you get the best of both worlds — the latest in Razer gaming technology with the comfort and reliability you expect from Microsoft. You'll also be able to improve your efficiency with 12 custom-programmable buttons that include two 360 degree jog-dials and two bumper buttons conveniently located on each side of the keyboard for faster control and optimized gameplay. What's more, you'll never lose sight of your keys in the dark with the cool blue ambient backlighting. Get the edge over your opponents in dim lighting conditions. 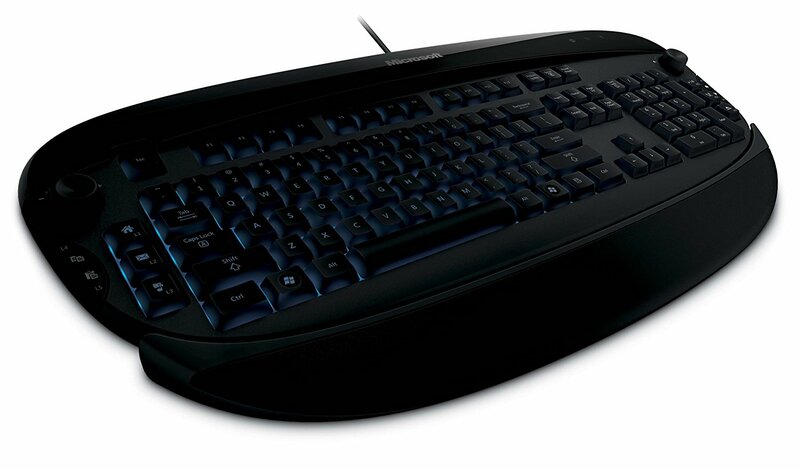 There's also a detachable wrist rest for maximizing comfort and ergonomics. Store your macros onto five different profiles with the Razer Reclusa Configurator to suit your gaming needs. With “on-the-fly” gaming detection, switching profiles has never been so convenient. Gaming detection allows you to automatically switch to the appropriate profile when a particular game is launched. Meanwhile, a smart cabling system allows you to stow away the USB cable when not in use or shorten it when necessary. Lastly, two gold-plated USB connector ports maximize connectivity and maintain transmission integrity. 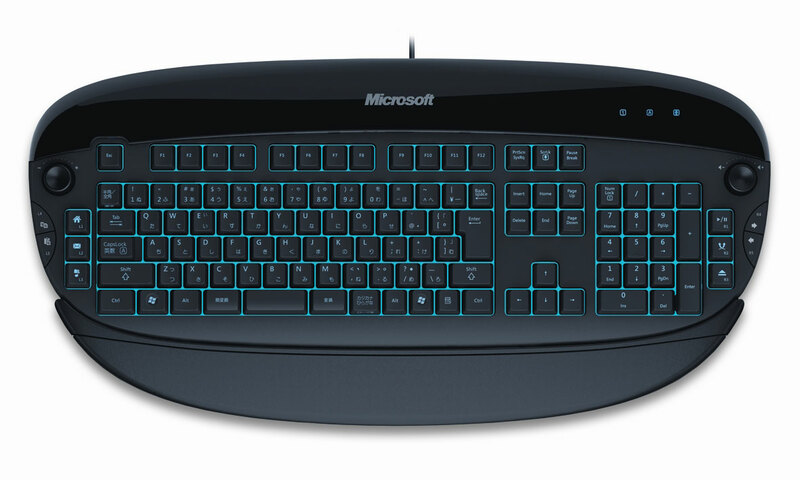 Microsoft Reclusa gaming keyboard with Japanese layout. 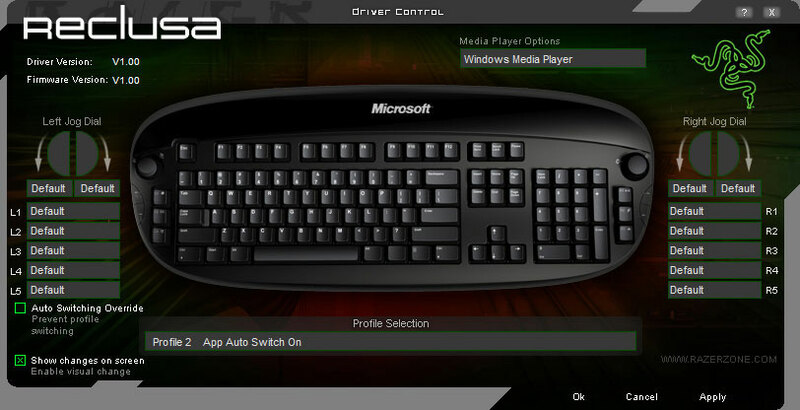 Reclusa driver software, developed by Razer. Note the 2 rotary dials, each can be programed.